New grille also designed to aid fuel efficiency. GMC has rewarded its solid-selling full-size SUV with a new transmission and some cosmetic upgrades for the 2018 model year. With a ten-speed automatic transmission, GMC claims the Yukon Denali will enjoy greater fuel efficiency than the eight-speed model, with the same familiar 420-hp 6.2-liter V8 doing the motivation. As well as having a wider 7.39 overall gear ratio spread, the gearbox has been programmed to deliver a smooth operation and an aggressive response when called upon. 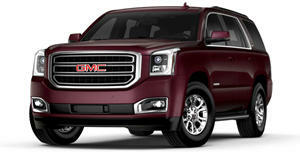 Aesthetic enhancements see a new grille that adopts a layered theme as seen on new models such as the Terrain and Acadia. As well as looking sharp, the new grille provides greater airflow to the radiator while active aero shutters can help reduce drag and improve economy by closing under certain circumstances. A Mastique Ash real wood trim is a new addition to the cabin, which now comes with heated seats up front and in the second row, ventilated seats for those up front, a head-up display, wireless phone charging, a hands-free power liftgate, 4G LTE WiFi hotspot, and an 8-inch infotainment system with satnav, Android Auto and Apple CarPlay. The Denali trim will be offered on the Yukon and long wheelbase Yukon XL when the 2018 model hits showrooms this fall. Pricing will be announced nearer the time.